One of the questions we often get asked where potential customers can see a live demonstration of the sublimation or ChromaBlast process. Of course, one of the things we plan to do is create videos that will demonstrate our products, but we also know that sometimes nothing can replace an on the spot demonstration. If you’re interested in seeing a live demonstration in the next few months, your best best would be to stop by the EnMart booth at either Embroidery Mart East in Nashville or at ISS Atlanta. Tom Chambers, our sublimation expert will be at both shows, and we will have a full set up, with printers and heat press in our booth. If you have questions or want to see the equipment in action, visiting our booth is a great way to see a live demonstration and also a great time to ask your questions. Tom is always happy to help customers find the system that will best suit their needs, and to answer questions. We will be in booth 401 in Nashville and booth 243 in Atlanta. To keep up to date on EnMart’s trade show schedule, you can always check the front page of our web site. Up in the right hand corner of the site there is a box labeled 2010 Trade Shows. This box is updated as we add new shows, or are given our booth number for shows that are already listed. If you would like to see a live demonstration and can’t make it to a show, the other option would be to visit our corporate headquarters in Traverse City, Michigan. This is where the management team is based, and where our sublimation demo room is set up. Appointments for demonstrations can be made by contacting us and asking to be added to the demo schedule. 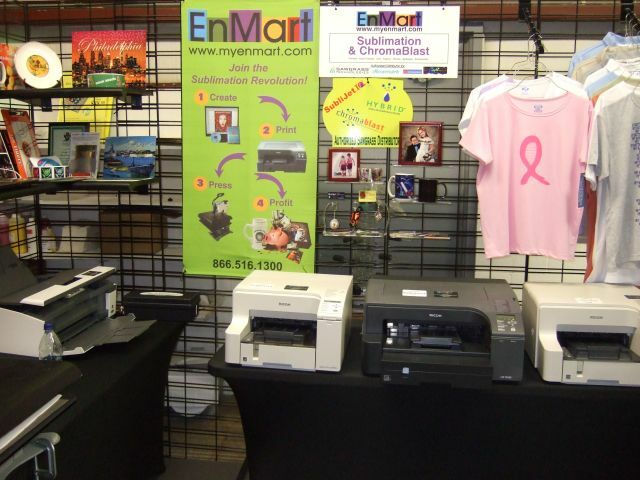 Demonstrations are set up based on availability of our sublimation personnel and as our trade show schedule permits, and generally last about an hour. As of right now, demonstrations are only available from our Michigan location. If you can’t visit us in Michigan and you are unable to attend a trade show, it may be possible to set up a demonstration through the account manager for your region, but those demonstrations are rare and are set up on a case by case basis.